Our family is a lover of breads. We love all kinds and deep down if I had to choose between bread and chocolate I am not sure which I would choose. Have you tried the Parmesan Bites from Dominos Pizza? They are super yummy and have become a family favorite. Since they are so well loved I thought I should make a version of my own. I made these up to go with our Baked Ziti and the kids just loved them (so did I). Roll Dough – you could make your own dough or use something like Rhodes Rolls (this is what I am doing today). I used Rhodes Rolls for my breadstick bites – they are great to use if you don’t have the time to make dough of your own. Put rolls on baking sheet or parchment paper and let thaw for several hours. Here they are straight from the bag frozen. Once thawed cut it half. Then cut in half the other direction. In one bowl melt some butter and in another put your grated parmesan cheese. Place some of the dough bites in the butter until nicely coated and then place in the cheese and roll around until nicely coated. Place on a cookie sheet lined with parchment paper. You don’t have to use parchment paper but it just helps keep everyting from sticking. Once you have filled a cookie sheet with your breadstick bites than sprinkle on some garlic salt. 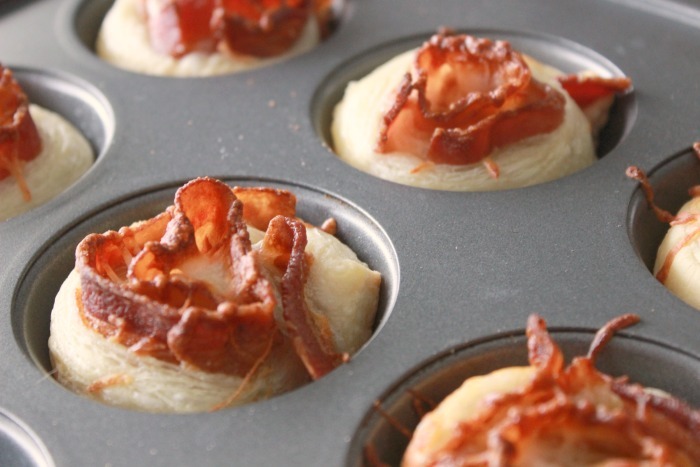 Bake them in a 350 degree oven for about 15 minutes – until they are golden. Once out of the oven spread some butter over the top of each breadstick bite. Serve them with a yummy Italian dinner like my Baked Ziti or with some sauce for a snack. Oh.MY.gOsh! YUM!!!! I’m a bread lover!! Looks awesome!!! Thanks Janette – they really are so yummy – I have also made these and rolled in cinnamon and sugar instead of cheese and they were divine as well! Oh YUM!! Carb lover here too! I’d be popping these in the pie hole like popcorn! I’ll have to look for that dough in the bag! Aren’t carbs jut the best! We couldn’t stop eating them 🙂 Glad I made you laugh! These looks so good I spent almost $4 on a bag of these rolls last night at WinCo so I could make them for my Pinterest party on Thursday. Thanks for sharing! Stacie I hope you like them! The rolls can be expensive but they do make a lot. It is almost cheaper to buy the Dominos ones but I like haveing the option of knowing how to make them at home. 🙂 Be sure to send me a link to your pinterest party on Thursday I would love to see it! Yummy! And from Rhodes no less. I’m definitely going to have to give these a try. I love the dominos version. Made these exactly to receipe and my bread is soggy not what I expected disappointed ???? I am sorry these did not turn out as you expected. I have made them several times and they always come out nice and crispy. How long did you bake them in the oven? Did they get golden brown and just were soggy on the inside? I would love to help figure out what happened. These are our families favorite part of ordering from dominos pizza! We are crazy for them! I love the idea of making these at home! Your welcome! We can’t get enough of them in our home! I really like this idea! Thanks for sharing on the What’s for Dinner Link up! It’s ridiculous how much I want to make and then eat these right now (note to self don’t look at recipes when you are hungry!) I’m looking forward to trying them soon. I hope you try them and like them! When we make them they are gone so fast! Oh man, these look great! I always order Domino’s bread bites – will have to try this recipe. Thanks for sharing! Stopping by from Share the Wealth Sunday party. So glad you like them! We love the Domino’s bread bites as well – always buying them! Ok, I am going to make these babies. My husband loves bread and this would be icing on the cake, so to speak. I would love if you share this at our link party, Dishing It & Digging It. You will gain more views and make new friends. happy Fall. I hope you and your husband love them! Mine our always gone that quick as well! Oh, yum! I bet my kids would go crazy for these! Pinned and sharing. Thank you for linking up at Family Joy Blog Link-Up Party this week! What a neat idea. Will have to try these in our house. Thanks – you will have to let me know if you liked them. Looks absolutely delicious! Thank you for sharing!